KANNAPOLIS, North Carolina (Feb. 6, 2019) – Just one year ago, Aric Almirola, driver of the No. 10 Smithfield Ford Mustang, made his debut with Stewart-Haas Racing (SHR) with an open mind and no expectations. A new crew chief, a new team and a blank canvas of opportunity. What he didn’t know was that he was about to embark on a record year – beginning with the 60th running of the Daytona 500. After nearly becoming Daytona 500 champions, Almirola and the No. 10 Smithfield Ford team led by rookie crew chief Johnny Klausmeier continued their success, knocking down 17 top-10 finishes, four top-fives, led 181 laps on the year and earned their first win Oct. 14 at Talladega (Ala.) Superspeedway to clinch a spot in the semifinal playoff round before finishing a career-best fifth in the championship. Almirola’s 181 laps led in the 2018 season were more than his previous six full-time Monster Energy NASCAR Cup Series seasons combined. The Mustang driver enters the 2019 season the same way he did last year, partnered for the eighth year with Smithfield, a brand of Smithfield Foods, which is based approximately five hours northeast of SHR headquarters in Smithfield, Virginia. Founded in 1936, Smithfield is a leading provider of high-quality pork products, with a vast product portfolio including smoked meats, hams, bacon, sausage, ribs, and a wide variety of fresh pork cuts. ● The 61st annual running of the Daytona 500 marks Aric Almirola’s 281st Monster Energy NASCAR Cup Series start. Almirola has one career Cup Series win at Daytona (Fla.) International Speedway – in the rain-shortened July 2014 event. The victory was the 34-year-old’s first Cup Series win. ● The Tampa, Florida, native has also earned two top-five finishes and two top-10s at the superspeedway and has led a total of 22 laps. In last year’s Daytona 500, Almirola raced for the lead on the final lap until he was involved in an accident with only one mile to go. ● Almirola has a career total of two wins, one pole, 15 top-fives, 49 top-10s and 357 laps led in 280 starts. ● His most recent Cup Series win came Oct. 14, 2018 at Talladega (Ala.) Superspeedway. ● 2018 stats – Almirola earned one win, four top-fives, 17 top-10s and led 181 laps during the 2018 season. Almirola’s 181 laps led are more than his previous six full-time NASCAR Cup Series seasons combined and he more than doubled his career-best top-10s in a single season. ● In addition to his two career Cup Series victories earned at Daytona July 6, 2014 and Talladega last fall, Almirola also has two NASCAR Xfinity Series wins at restrictor-plate tracks – July 1, 2016 at Daytona and May 6, 2017 at Talladega. ● The Clash – Almirola is eligible for this year’s non-points Clash at Daytona. It will be his fourth appearance in the 75-lap race with a previous best finish of sixth on Feb. 16, 2013. This non-points event features pole winners from the 2018 season, along with former Clash winners, former Daytona 500 race and pole winners who competed full-time last year, and last season’s playoff participants. The event has been run in one form or another since 1979. ● Crew chief Johnny Klausmeier is in his second full-time season as a Cup Series crew chief. The Perry Hall, Maryland, native transitioned from an engineer to Almirola’s crew chief for the 2018 season. Klausmeier has one win as a substitute crew chief while filling in for Tony Gibson at Pocono (Pa.) Raceway in June 2016, and one win as a crew chief for Almirola last fall at Talladega. As a race engineer at SHR, Klausmeier has worked with drivers Ryan Newman, Danica Patrick and Kurt Busch. 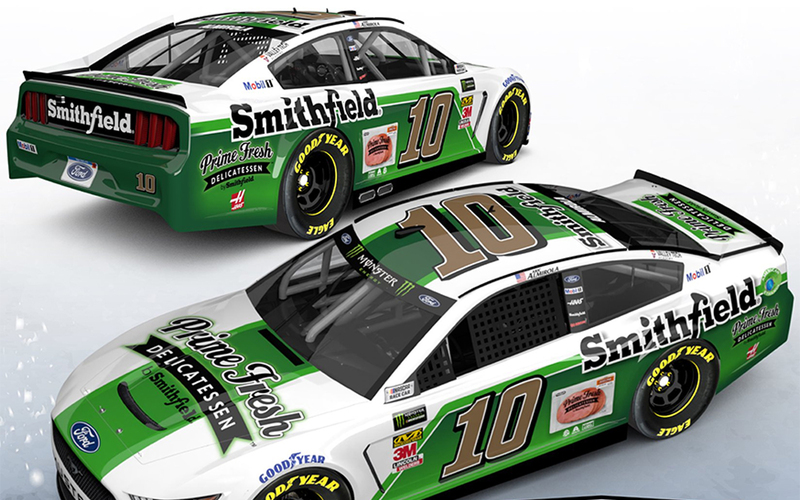 ● New paint – Almirola will sport a new green-and-white Smithfield Prime Fresh Delicatessen paint scheme in the Clash at Daytona. Smithfield Prime Fresh Delicatessen offers customers the freshest, highest-quality deli meats without the wait. ● Smithfield rejoined SHR this season and will be the primary partner for the majority of the season on the No. 10 Ford Mustang piloted by Almirola. Founded in 1936, Smithfield is a leading provider of high-quality pork products, with a vast product portfolio including smoked meats, hams, bacon, sausage, ribs, and a wide variety of fresh pork cuts. ● Offseason – Almirola stayed busy this offseason with an array of special events. He participated in Chris Paul’s Celebrity Bowling Invitational, visited his hometown of Tampa, Florida to preview the new season with local media affiliates, served as the grand marshal of the Gasparilla Children’s Parade sporting his No. 10 Smithfield Ford Mustang, and swapped jerseys with defensemen Braydon Coburn of the National Hockey League’s Tampa Bay Lightning before enjoying a game with his family. He spent the rest of his time in the gym, around the shop with his team and his family in preparation for the 2019 season.